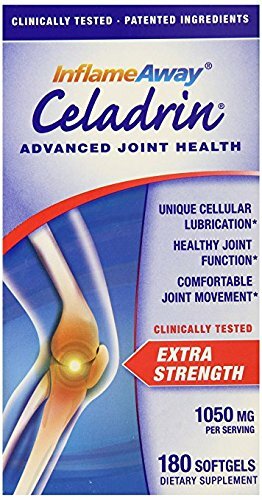 Celadrin, a cellular lubricant, is a brand new joint health breakthrough that uniquely provides fast, long lasting joint comfort. Most people start to feel results in 30 days or less. Cumulative benefits are achieved through long-term daily use. The cause of wear on the joint area can be linked to insufficient lubrication and cell membrane fluidity. Celadrin provides continuous lubrication and cell membrane fluidity and elasticity. Celadrin is a powerful, novel, clinically proven, scientifically arranged matrix of all natural, esterified oils. In double blind, placebo controlled, peer reviewed, published studies, Celadrin has demonstrated to lubricate cell membranes, promote comfortable joint flexibility and provide cushioning properties. Celadrin safely and effectively reduces inflammation. Celadrin is demonstrated to be faster and more effective than Glucosamine/ Chondroitin. *These statements have not been evaluated by the Food and Drug Administration. This product is not intended to diagnose, treat, cure or prevent any disease. If you have any questions about this product by Celadrin, contact us by completing and submitting the form below. If you are looking for a specif part number, please include it with your message.